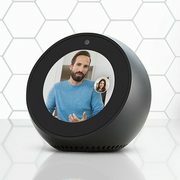 Amazon Canada Amazon.ca Device Deals: Echo Spot Smart Display $135, Echo Smart Speaker $100, Fire TV Stick 4K $55 + More Get the Fire TV Stick 4K for $55 + More! Add some new tech to your home at Amazon.ca, because you can save up to $40.00 on several Amazon devices including the Fire TV Stick media streamers and Echo smart speakers! We've listed the featured devices to help get you started. These offers are effective for a limited time. Amazon.ca offers free shipping for all Prime members or on orders over $35.00 for those who aren't members. Is the ethernet adapter necessarily needed? was waiting for this, thank you op! I have a chromecast Ultra and I would say no. However wifi speeds aren't great for stable 4k video, it also depends on your wireless router, distance from the AP, interference etc. Wired is definitely better. Hmmm, is it worth the $15 more for the 4K ? Picked up the 4K last time it was on sale and have not regretted it. My big issue is that I have chromecasts, is it possible to setup speaker groups with these? In addition to speed, memory and 4K support the 4k version now has Miracast which might help the "is it work $15 more" question. Does anyone know if a Fire TV stick from here will work in Europe while travelling? Thanks OP, ordered one. I was waiting for it to go back on sale since I missed the last sale. I just grabbed the regular one. If i don't like it, i'll just return it and get the 4K version. I already own a couple, and they are well worth the money. For those who are fans of CBC and use their GEM app (was previously called CBC TV) on other devices for viewing content, it was announced that the GEM app is coming to the FireStick (and Android TV) next week. Yea! Yes, it should, the content in the apps might be affected by geolocking. 3rd party streaming apps like CyberFlix and TeaTV will be fine. Was wondering if this would work with the CBC app-- thanks. Nothing beats streaming playoff games for free and being able to cast it is even better. does it support bluetooth remotes like the Rii or do you have to use the supplied remote? also, with the added usb ethernet adapter, is it a 10/100 or 1000 Mbps (GigE) connection?